Ernest Tubb was a second generation country music star. 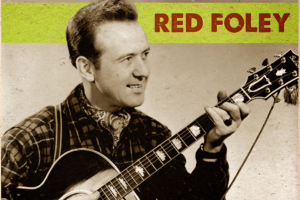 Profiles of the singer/songwriter paint him as a follower of Jimmie Rogers, who was known as “the Father of Country Music.” Rogers, though he died long before Tubb became a star, would have a lot to do with his rise. Tubb – called The Texas Troubadour – was born into a family of sharecroppers in Texas. He was befriended by Rogers’ widow, Carrie, who took him under wing. She helped him get a contract with Rogers’ label, select material and aided him in other important ways. Tubb started out miming Rogers, but a tonsillectomy made it impossible to copy Rogers’ trademark yodeling. That, presumably, forced Tubb to develop his own style more fully. Profiles at Wikipedia, AllMusic and elsewhere say that Tubb was one earliest honky tonk country singers and one of the first to cross over: He had a hit with “I’m Biting My Fingernails and Thinking of You” with The Andrews Sisters, who were jazz singers. Whatever Tubb did worked: He headlined a presentation of the Grand Ole Opry at Carnegie Hall in New York City in 1947. That’s quite an accomplishment for a country singer from Texas. Tubb was inducted into the The Country Music Hall of Fame in 1999. He was not known to have the best voice, which is not such a great thing for somebody who made his living singing country songs. In fact, many people — including Tubb — made fun of it. Regardless, he became one of most loved country stars of the middle of the last century. In all, Tubb put 91 songs on the country charts, according to AllMusic. He returned the help that Carrie Rogers accorded him by featuring young talent on the radio show that he hosted in association with the Nashville record store he opened in Nashville in 1947. 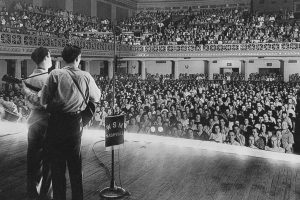 “The Midnight Jamboree” aired after the Grand Old Opry on Saturday nights. The show – and the record store (now a chain of three) – still are going strong 30 years after his death.